Last Monday, I was introduced to a unique skin whitening product called Mosbeau Placenta White. The product features a component that is new to skin products - the Placental Protein. This new skin product which is not necessarily an acne cleanser,is manufactured from Japan where high quality products come from. Below is the official Press Release of Mosbeau Placenta White. Protein for skin is in! Meet the latest buzzword in skin whitening, Placental Protein—the ingredient that is considered as the “next big thing” in the industry of health and beauty care. Widely known in Japan for its superior whitening properties, Placental Protein is used in cosmetics and dermatological preparations as it has the ability to speed up skin renewal, making the skin look fairer and more radiantly youthful. With the advent of this revolutionary component, it is now commonly used in clinics, and is infused in topical products, supplements, and injectibles. But going beyond whitening, it has also been revered by many cultures for its skin-healing effects. While it actively inhibits melanin growth, placenta’s unique biological components, such as active enzymes, vitamins, and anti-oxidants that stimulate skin cell renewal and slow down skin aging process, make it effective in revitalizing the skin and reducing the appearance of wrinkles and fine lines. At the onset, as Placental Protein penetrates the world of skin whitening, experts say that this ingredient may already outdo the very popular skin whitening ingredient Glutathione. Such premise was validated by studies conducted in Japan, where it compared the two whitening ingredients, with the results showing that Placental Protein is twice as active as Glutathione in terms of slowing down the enzyme tyrosinase, with 63% inhibitory effect, as opposed to the latter’s 32% tyrosinase control. 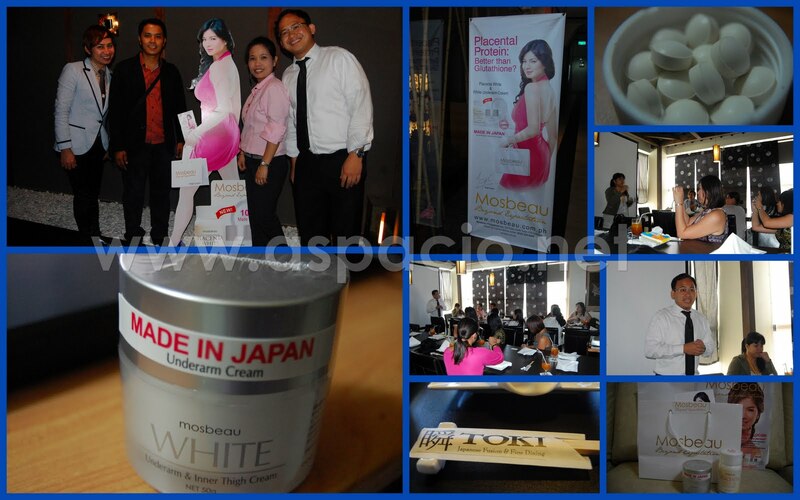 Today, Japan takes the most beautiful transforming ingredient to the Philippine shores via Mosbeau—a sensational skin whitening brand that offers two of its bestselling products: Mosbeau Placenta White and Mosbeau White Underarm & Inner Thigh Cream. These whiteners, available in beauty stores across Metro Manila, both contain the ingredient Placental Protein. Sourced from three generations of healthy pigs in Japan, Mosbeau’s Placental Protein is highly compatible with human skin. The type of placental extract used by Mosbeau is also the same kind used in clinics in Japan, ensuring that it is safe and effective. For Mosbeau’s Placenta White, it is the first placenta supplement in the country that effectively whitens skin, and cleanses the body system with its anti-oxidant properties that gives the skin a fairer, radiant glow from within. Mosbeau’s CEO and founder, Mr. Mitsuharu Hayashi, shared that the introduction of this Placenta supplement in the Philippines aimed to create a cut above the rest of the skin-whitening products in the country, “We wanted to offer Filipinas other, if not better, option aside from Glutathione. 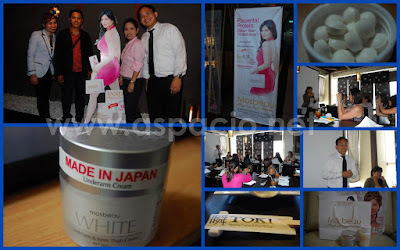 Previously offered in Japan, Mosbeau Placenta White has been a tried and trusted skin-whitening supplement in Japan and we believe, considering that it has a breakthrough formulation and can deliver satisfactory results, that we will have the same overwhelming reception here in the Philippines”. Mixed with Collagen, Vitamin C, Glutathione and Asparagus Extract there would be no need for other vitamin supplements to enhance its whitening and anti-aging effect once a tablet of Mosbeau Placenta White is taken. In the case of Mosbeau White Underarm & Inner Thigh Cream, a liberal application to the skin would make anyone flaunt their radiant white skin in any season. This cream, which contains Placental Protein, Daisy Flower Extract and other all-natural skin-whitening ingredients, specifically targets to whiten stubborn, dark areas such as the underarms, inner thighs, knees, elbows, areolas, and even other dark spots. Mosbeau guarantees that all products are 100% made in Japan—from research, clinical test, production and development, down to the packaging—thus providing its customers a high-quality whitening experience that transcends physical beauty. Placenta White and White Underarm & Inner Thigh Cream are available at leading health & beauty stores and drug stores all over Metro Manila including Watsons, South Star Drug, Bench Fix Salon, PCX, Health Express, Rose Pharmacy and Health Food. To find out more about Mosbeau, visit http://www.mosbeau.com.ph.